For the legal industry, success depends on the promise of transparency and auditability for all participants. The ANB will allow organisations to digitally manage the lifecycle of a contract, not just from negotiation to signing but also continuing over the term of the agreement, with transparency and permissioned-based access among all parties in the network, by using blockchain-based smart contracts to trigger business processes and events. These contracts contain smart clauses which have the ability to record external data sources, such as Internet of Things (IoT) device data and self-execute if specified contract conditions are met. The platform will represent a significant new piece of infrastructure in Australia’s digital economy. The ANB will soon invite regulators, banks, law firms and other Australian businesses to participate in the pilot, which is expected to start before the end of the year. Should the Australian pilot be successful, the consortium intends to roll out the technology to other markets beyond Australia. So, it will be a … database platform! And it runs a computer program — sorry, smart clauses — when a given condition is met! The legal industry really needs this, apparently. At present it’s IBM-backed hot air, with only a concept as yet. But it’s gonna be great! 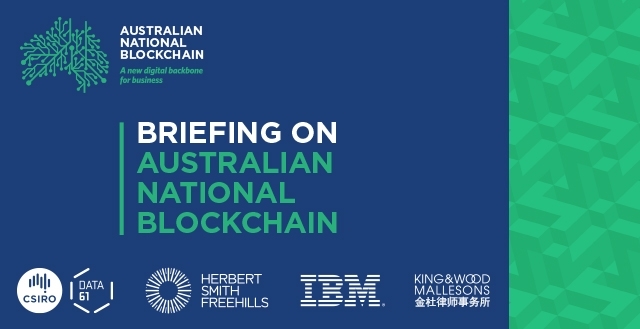 The Australian National Blockchain is being set up by a consortium — legal and professional services consultancy Herbert Smith Freehills, lawyers King & Wood Mallesons, the CSIRO’s “data innovation group” Data61, and IBM. The ANB was announced in a CSIRO press release on 29 August 2018 — New blockchain-based smart legal contracts for Australian businesses. The press release uses the word “potential” and “could” a bit much for the tricky bits. One of these challenges is to understand how so-called ‘smart contracts’ may be treated under the law as it stands today and to what extent it is necessary for the law to evolve in order to keep pace with the digitisation of business practices. This talks as if business processes aren’t already automated, as if business programmers don’t already make changes for legal requirements, and as if the legal system is somehow unable to cope with this. The King & Wood Malleson side have been pushing “blockchain” hard too, or something of that name. I wish I could say that “Technology Meets Dispute Resolution on the Belt and Road” by Meg Utterback of KWM — a pitch for work on China’s Belt and Road Initiative — was unusually incoherent, uninformed and uninformative for a blockchain white paper. Natasha Blycha, from Herbert Smith Freehills, is the legal face of the Australian National Blockchain. She talked about the ANB on Blockheads TV. Blycha came to the initiative as a technology lawyer. The driving force was not an outside need that smart contracts on blockchains could fulfill — it was to make “smart contracts” themselves legally viable. It seems that computer programs aren’t actually the same as legal contracts. When pressed once more with “Do you want to give us an example of where that’s operating with one of your clients?” (6:06), Blycha paused with a stunned mullet fixed smile for several seconds, then started talking in generalities about the concept of smart contracts. It seems the oracle problem — getting real-world data into your smart contract without human inspection — will be solved by, ooh, an Internet of Things sensor on a weigh bridge detecting a load has arrived … and never mind that a human would still need to check that the load was what had been contracted for. None of this bafflegab addressed any of these obvious problems with smart contracts — Blycha talked at length, but noticeably avoided answering the hard parts. Went to the briefing last night. It is a concept only, there is no code. IBM will helpfully provide the cloud in which the “nodes” are run. It was not explained how “permission by authority” differed greatly from account permissions in a shared database. The main justification was that if you have one database being used between two parties, and then another sub-supplier one of them uses is on a different database, it is more efficient for them all to be on the same database/blockchain. So basically it is a giant shared but segmented (you can’t see the contracts for other people) database, with the word “blockchain” stuck on it. I didn’t bother asking: “so what happens if you make a mistake then and have to amend an ‘immutable’ contract.” Because if it is permission by authority, then the two parties just agree, “yeah whoops, we made a mistake,” and you change it. Or a judge orders the parties to change it. It basically came across as being: the big database will cover 90% of the “normal use” case where the contract is running fine and the database is basically just recording stuff associated with the contract, stuff delivered on time, in spec, etc., etc. Just sitting there collecting data, basically, and guiding parties on what each of their obligations are, or spitting out notifications when a non-compliance (late delivery, etc.) occurs. Disputes go outside the smart contract, and into the normal litigation channel. So feels like one of those things where the word “blockchain” is inappropriately appended for marketing purposes. They will change the name within 12 to 18 months, is my bet. I sort of feel for the lawyers pushing it — they have a (correct) inkling that, somehow, someone (Google, Amazon, SAP, Oracle, etc.) is going to come and automate away a lot of low level scut work to do with contracts and paralegal work, through some mechanism of IoT sensors recording like literally every data point for everything to do with the supply chain, and then that linking up to some big automated database that just does routine contract stuff like record delivery, consignment notes, payment to suppliers, etc., etc. It is just as applicable to low level financial contracts like securities lending agreements (where there is a standard form agreement the whole industry uses). So they want to somehow get ahead of that and create the system that is the “public utility” backbone that this runs on. There is also some natural justice implications, in that, if lots of contracts are going to be semi-automated smart contracts that run on a big database, wouldn’t you rather that database is run by a consortium with government oversight/NGO participation and not just run by, say, Google. The guy from IBM was actually Paul Hutchinson, VP Blockchain Asia/Pacific & VP Cognitive Process Transformation. This is him on stage with Natasha. I’m skimming it now, but the content is very similar to the briefing. For every use of blockchain you would consider today, there’s a better technology. – Technologists who don’t understand business , and believe that technology solves business problems (e.g. assuming that just because a database doesn’t require a central administrator, therefore presto no intermediaries are required… as if the only thing intermediaries do is to run databases.